This week hails the holiday of Thanksgiving for humans living in the Earth country called The United States of America. Being a American-created holiday, it focuses on American's favorite activities. First, there is a day of eating, followed by a day of shopping. Also, apparently there is some football watching, though my observances are inconclusive if this is part of the holiday traditions or merely normal everyday behavior that continued during the holiday. 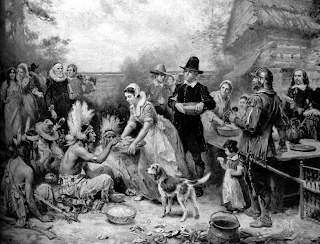 The first day of Thanksgiving celebrates the day American colonists arrived from the old world* and ate all the native Americans. To commemorate this day of conquest, humans gather together with their family members and eat large, cooked birds (symbolizing the "Indians"). Also, there is pie. Following the day of consumption, the second day of Thanksgiving is focused on purchasing consumable goods from chain stores. 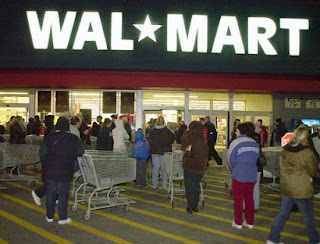 This is apparently a contest among the Americans to see who can purchase as many items as possible in a single day (I am inferring this, as I see no other reason for the frenzy given that these consumable goods are available both before and after day two of Thanksgiving, and purchasing them on any other day would be a simpler and more comfortable experience). Predominantly the female American humans take part in this contest, and must survive through rounds of driving very early in the morning, finding a parking spot, and the traditional running of the fat ladies. It appears to be a grueling, dangerous experience. Fortunately, they have loaded up on carbohydrates the day before. Eager combatants outside of the arena. When a winner of the competition is selected, the surviving female combatants return home to divide up the remaining piles of food and retain the remaining piles of resentment. Everyone hates themselves for ingesting so much on Day 1 and prepares to repeat their mistakes throughout the following holiday season. *not literally another world, but merely another country on the same world. "The Old World" is merely a term used by humans, indicating their dim view of the universe and how it works. THIS, dear readers, this is precisely why I am so fascinated by the Yahoo's Most Popular Feature. Think of the myriad possibilities for photographic presentation even on your unpalatable planet: occurrences of nature's splendor, informative instances of newsworthy topics, other members of your species that you somehow are able to find physically desirous. 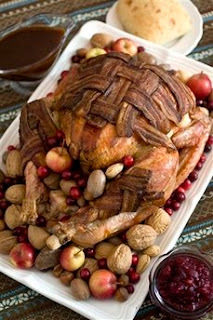 A photograph of turkey, wrapped in bacon. There is nothing the human race would rather look at at this precise moment in history than the cooked carcass of a fowl, sheathed in salty stripes of flash from a slain swine. What must it be like to be a member of a species that must ingest food to live, yet constantly craves food that will hasten your demise? How do you endure this inner turmoil? Does it make you hate yourselves as much as I hate you? I think it must do. So while your Earthen economy crumbles, human vs. human wars rage across your globe, please continue to use your feeble mental facilities to find new things to wrap bacon around. It amuses me to see you suffer so. Oh, Roland Emmerich. What a sad man you have become. Going back to the disaster movie well yet again even though the it's long run dry? This movie may purport to take place a few years in the future, but cinematically, Emmerich and company are very much stuck in 1996. People had already stopped wanting this kind of everybody-runs-for-their-lives/buildings-topple-and-crumble shock fluff even before it brought up uncomfortable memories of real-world horrors. These days, your fellow humans don't just find it tired and cliché, but also disturbing and distasteful. Emmerich's Independence Day partner, Dean Devlin, at least had the sense to move on to other things. Sure, one of those things was a series of TV movies about an action-Librarian, but at least the man understands that there IS a concept of branching out, even if he doesn't know how to do it well. I don't believe for a moment that, as this movie suggests, the world will end in the year 2012 since my fellow Superions don't plan our invasion until many years later, but if it did, at least we could take solace in the notion that it would probably be the only thing that would finally stop Roland Emmerich from trying to make Independence Day yet again. You'd think a man so steeped in the tropes of calamity would understand that lightening never strikes in the same place twice. 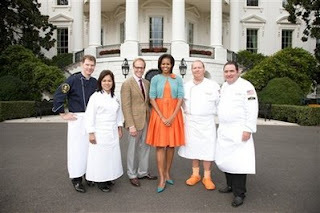 The caption: This undated photo courtesy of the Food Network shows chef Bobby Flay, from left, and White House chef Cristeta Comerford, Alton Brown, first lady Michelle Obama, chef Mario Batali and chef Emeril Lagasse. An episode of 'Iron Chef America' will be taped at the White House pitting Flay and Comerford against Batali and Lagasse. The episode aris Jan. 3, 2010. CHEF MARIO BATALI: Is it appropriate for me to wear my silly plastic crocs while visiting the White House? FOOD NETWORK EXECUTIVES: Yes, but only if they match the first lady's dress. CHEF MARIO BATALI: Great! Also, I won't be wearing pants. You may have noticed there is advertising along the side of my amazingly-well-written blog entries. Hey, even superior beings from outer space have to pay the bills, you know. Anyway, I realize the ads will change from time to time when the page reloads, so you may see different ones than I do, but I was mortified to see an advertisement for cloning appear on this very page. PLEASE do not clone addition humans, you're making more than enough the old sweaty way, don't attempt to scientifically breed more! I don’t have an issue with you "playing God", I'd just hate to think you stinking poop machines might be able to replicate even faster. Remember, if cloning is allowed, Garth Brooks may clone himself. Stop the madness! On today's visit to Yahoo's Most Popular, I was absolutely delighted to see the picture posted below. 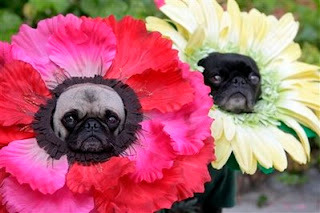 The caption reads: "This photo taken Oct. 4, 2009 shows pugs Mochi, left, and Olive posing for a photo dressed in their Halloween costumes at flowers at their home in Huntington Beach Calif. The stepsisters have been geisha girls, surfer girls and sushi over the years. They may not understand the tradition, but 'pugs understand positive energy,' explained dog owner, partner and costume designer Lisa Woodruff." Ha ha ha - NOT TRUE! I absolutely should not be telling you this, but this particular image tickles me beyond the point of reason. The creatures you see in this picture are not, as you have always presumed, and offshoot branch of the canine family, descended from wolfy ancestors. Nay! They are instead, alien spies from the planet Kugagulon, sent to observe and report on your planet, much as I have been. Unlike me, however, who flaunts his status as a Superior being, unafraid of any retaliation you feeble creatures may attempt to confront me with, the Kugagulons attempt to disguise themselves as docile things. Most take the route of pretending to be domestic pets. The two pictured above are actually attempting to pass themselves off as blossoms of earthly plantlife. Even inferior human eyes can easily see though such a cheap disguise, but still misinterpret what they see as cute little doggies dressed up for play. Honestly, between you humans and the Kugagulons, it's difficult to see which is the stupider race. And then I remember that at least the Kugagulons have trained you to pick up their excrement for them. Humans lose again. As a student of human behavior, from time to time I enjoy checking in on Yahoo's Most Popular listings to see what topics and images you poop machines are currently finding to be the most mentally stimulating. It's always an illuminating experience about the level of human intelligence and culture. 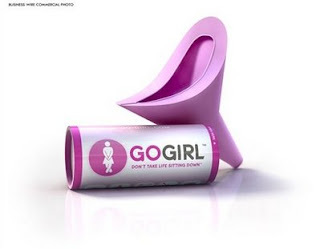 The caption: "A perfect stocking stuffer for active women, GoGirl allows the simple convenience of taking bathroom breaks standing up in situations where restrooms are unfit or nonexistent." Astonishing. I pity you poor creatures and how you are enslaved to your own biological inefficiencies. The first thing I don't understand about this is how with your constant need to excrete waste matters you apparently have not built an adequate supply of urine receptacle stations. The second thing I don't understand, is how you have allowed your few urine to become in such a state of disrepair that they are considered unfit next to the option of excreting through a funnel into a soda can. Finally, couldn't you just buy a funnel and a soda can? Particularly since that option would not include writing on the side that indicates to anyone who sees it that you're carrying your own pee holder around with you. Obviously this movie is simply a human propaganda piece, designed to trick hostile alien creatures into believing that human beings are capable of heretofore unrevealed psychic powers like the fearsome MENTAL RAYS of my own Superion brethren. Have you ever felt the sting of the Superion MENTAL RAY, human being reading this? It's a stingy, stingy thing, my friend. It will give you SUCH a headache, you don't even know! Let me use this movie to illustrate a point about our incredible mental powers to you. In this movie, apparently George Clooney uses mind powers to kill goats. In reality, WE are the George Clooneys and human beings are the goats. Baa for me, cretins! Eat a tin can, poop machines! Goats! In this movie, Frank Langella presents Cameron Diaz with a moral conundrum: she will receive one million dollars if she presses a magic button that will kill some other random human being she doesn't know. Given Cameron Diaz's mental prowess, this somehow fills up the entire run of a full-length feature. Allow me to present YOU with a moral conundrum, Frank Langella, I will give YOU a million dollars if you will just GIVE ME THAT BOX! I think that Hollywood is attempting to trick moviegoers into thinking that this movie is a sequel to Stephen Spielberg's popular, but insipid "Close Encounters of the Third Kind." Keep your money, though, gullible ape-descendents. There will be no oh-so-riveting mashed potato stacking scenes this time around. This looks like it's just another racist Hollywood movie that portrays all aliens as hostile hate-filled creatures that want nothing more than to destroy, torture, or enslave human beings. I could just kill all of you for that! The last thing the people of Earth need is yet another re-telling of A Christmas Carol (especially one that opens the first week of November). Following numerous stage and screen adaptations featuring real-live disgusting human beings (both singing and non - and even a ballet), there have also been TWO Muppet versions, TWO versions starring cartoon ducks, numerous other animated versions, parodies, satires, and as many tired retreads as there are zeroes in Scrooge's bank account. But Robert Zemeckis loves the new technology of "motion capture" (a silly technique in which computers copy the movement and expression of actors to animate computer-generated characters, generally diluting the artistry of both the actor and the animator. Well done, human progress) and since there is a new technology available, it needs must follow that someone will feel obligated to trot out yet another version of "A Christmas Carol." Perhaps sensing that a technological innovation was not quite enough justification for the 7,638,422 version of this story, Zemeckis has apparently come up with another way of separating his version from all its predecessors: his will have almost nothing whatsoever to do with the source material. Of course, as always I'm judging from just the previews as I have no intention of actually seeing this movie, but this latest version seems to be a massive departure from the familiar. 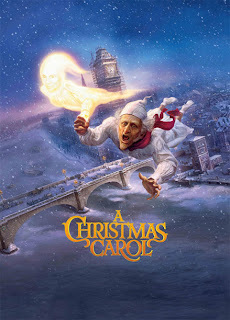 Traditionally, A Christmas Carol is the story of a miserly old man named Ebenezer Scrooge who, through eerie and somber visitations from the ghost of an old friend and the spirits of Christmas past, present, and yet-to-come, learns that the self-serving decisions he's made throughout his life have earned him a great deal of material wealth, but robbed him of any warmth, love, or kinship with his fellow man. Given the opportunity to repent, Scrooge becomes invigorated when he decides to embrace humanity and help those less fortunate than himself. Zemeckis seems to have eschewed all that gloom and nuance and opted instead to focus on a central character who is constantly shot violently through the sky, dragged at terrifying speeds by The Human Torch, and slammed repeatedly into giant icicles. Ebenezer Scrooge's Funniest Home Videos. I suppose it's possible that I'm forgetting Scrooge's description of a nightgown-clad Ebenezer Scrooge arcing across London's night sky, his arms flailing madly, his slippers dangling precariously, his eyes wide in hilarious terror as he draws his catch phrase out in fear "baaaaah-huuuuumbuuuug!" someone - perhaps nephew Fred - will be forced to utter the line "Oh - that's gotta hurt." Double for nothing they sneak in a bit of gastronomical emission humor somewhere. Oh, and did I mention this movie stars Jim Carrey? Did I even need to? Kind of makes those cartoon ducks look like Masterpiece Theatre, doesn't it? Why can't the homo-sexual humans marry? I see from your recently-held human elections that Earthlings continue to not want to allow individuals attracted to members of the same gender (or homo-sexuals) to unite in a legally-binding ceremony signifying mutual love and the intention to tie one's fates to the other. Humans of differing genders may engage in such ceremonies (and often do), though while the language of such ceremonies express the intention that this union will last until the death of one or both of the individuals involved, they appear to mostly be kidding about that. On Superion, we reproduce asexually (for the ignorant among you, this means we do not require a partner to produce an offspring). Still we can (and DO) engage in physical relations with other Superions, though that's because sometimes Daddy's got wants instead of needs. The point being, Superions do not have as strictly defined gender roles as you humans do, so I am fascinated and confused by your desire to restrict one another's ability to achieve happiness based on gender preferences. Now, granted, I'm in favor of almost anything that keeps human beings from achieving happiness, as I loathe and detest (yes, both!) your entire species, but I remain confused about the distinction. If I understand one argument correctly, humans who prefer to wed those of an opposite gender (or hetero-sexuals) fear that allowing humans who prefer to wed those of an identical gender (or homo-sexuals) will pose a direct threat to the traditional (i.e. opposite gender union). I have never once heard of one of the homo-sexuals saying that they want ONLY homo-sexual unions allowed. Do the hetero-sexuals fear that once the homo-sexuals are allowed to wed, they will suddenly become irresistible to everyone? Aside from Angela Lansbury, I find no human beings physically desirous, so it's hard for me to judge, but I suspect given many of the homo-sexuals proclivity for flamboyant dress and rhythmic dancing, this may be a genuine fear. And yet, for some reason, hetero-sexuals choose not to make any of these items illegal. While I applaud humanity's ongoing efforts to make each-other miserable, if I were able to choose between banning homo-sexual or hetero-sexual unions, I would certainly choose to ban the latter. Hetero-sexual unions result in far too many additional human beings running around Planet Earth. As it is, once the Superion Invasion Fleet takes over your planet, we're going to have to kill at least half of you anyway. If you could all gay up and stop making more babies in the meantime, it's going to be a lot less miserable once the rest of my kind get here. Welcome to my new blog, humans. Prepare your feeble minds to be blown! Perhaps a very tight hat might assist you in keeping some of your brains within your skulls, but I think not! Minds will be blown! After many years of writing movie reviews, advice, and opinion pieces on my previous page over at Cap'n Wacky's Boatload of Fun, I'm now entering the world of blogging. When I first heard of "the world of blogging" I believed if to literally be another world, and hoped to escape my exile among you filthy humans by traveling to it. Unfortunately, I understand that it is not actually another planet, but at least it's a new venue upon which I may vent. You're welcome in advance for the superior opinions, perspectives, and analysis coming your way. You will thank me latter. Unless your mind is blown completely off.